Over recent years more and more street art has appeared across Sydney and finding the newest murals has become a bit of a hobby for me. 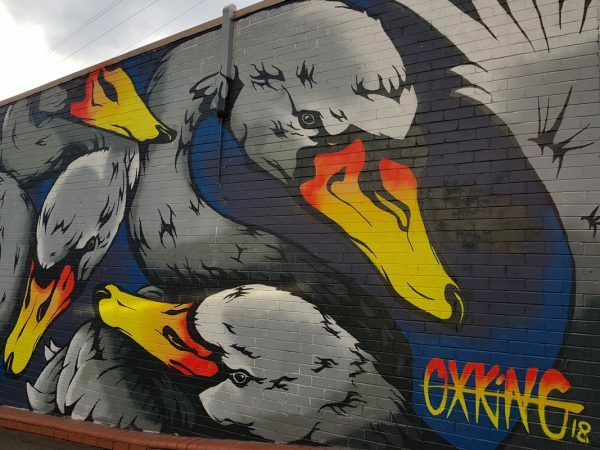 I have written extensively about the art of the inner west, but today I decided we should go exploring a little further afield and find out what else Sydney has to offer street art lovers. 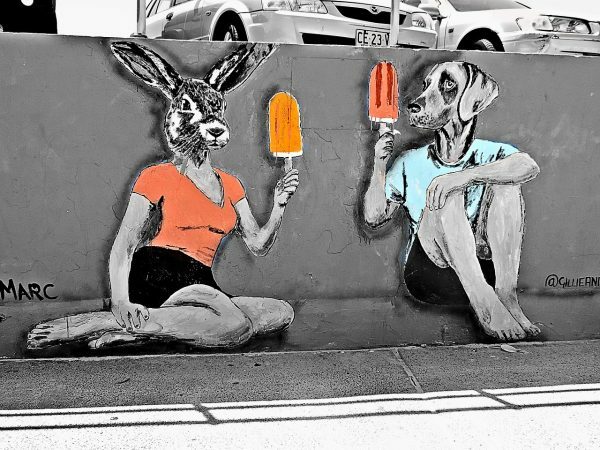 We are pinpointing a bunch of suburbs where you can find Sydney’s best street art, and we are also going to tell you how you can get there using public transport. The Bondi Graffiti Wall curves around the boundary between Bondi Beach and the car park. In the late 70s, the Wall became increasingly popular with graffiti and street arts. After several years of efforts to paint over the wall it was finally adopted as a legal space and for the last 12 years has been under local government control. While you are in Bondi make sure you check out Icebergs Dining Room and Bar both the indoor bar and the terrace are great spots to relax and take in the view, drink in hand. If you are here on the weekend, there is a popular market held on the school grounds across the road from the beach. Saturdays is a farmers market and Sundays a more general market with lots of fashion and accessories from upcoming designers. How to get there: Bus 380, 381, 382 from Bondi Junction or 333 from Circular Quay and the city. 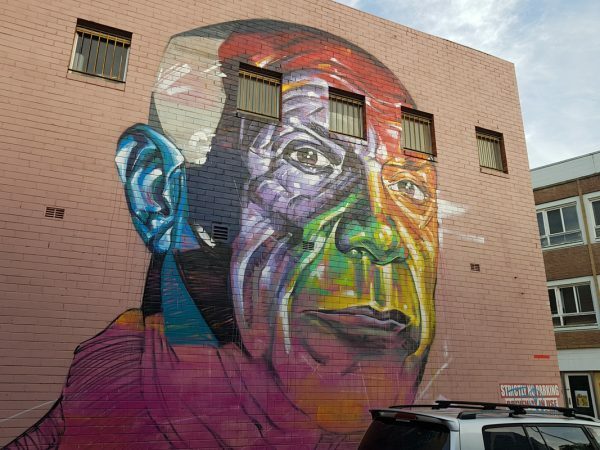 Street art in the CBD is less widespread than in other areas in Sydney due to years of regulation banning it. The Sydney City Council only recently relaxed these laws and as a result, more legal work should appear soon. 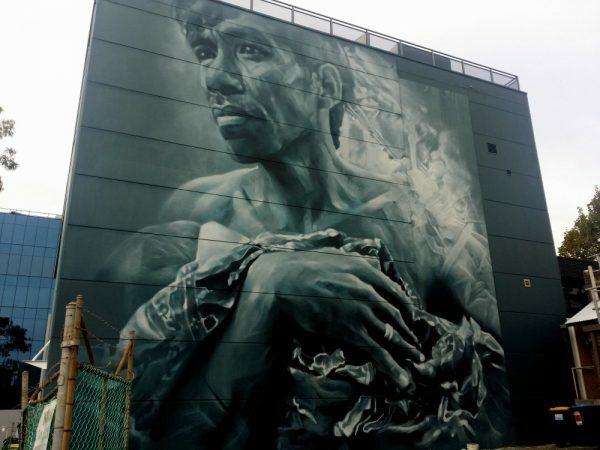 One of the new development requirements from the city council is to have artworks on building hoardings. This one is in Phillip St. The first step is a new requirement for developers to showcase art to any hoardings they put up around their building sites as you see above. My friend Joanne has written about these on her blog. 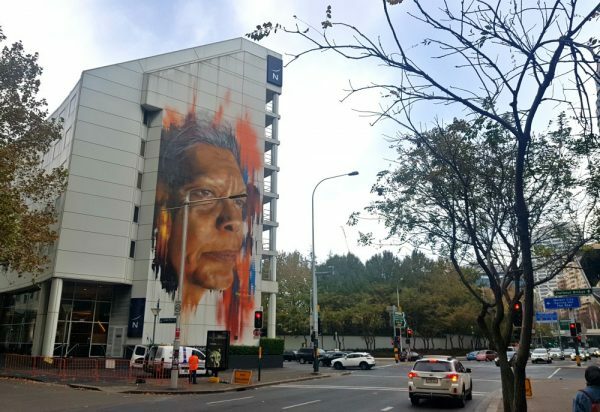 One of the most striking murals in the centre of the city is of Aboriginal elder Jenny Munro painted by one of my favourite artists Matt Adnate. You will find it on the edge of Darling Harbour on the wall of the Novotel. This is a fantastic place to call home while you’re exploring the city, and there are plenty of Sydney CBD hotels throughout the city. It’s also a good base for budget dining with the best Asian food outside of Asia right on your doorstep. 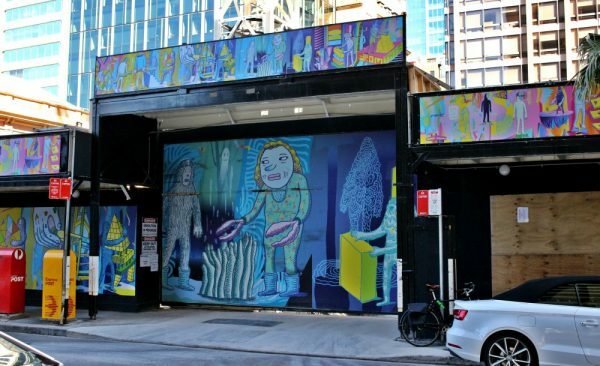 Bordering Central and Redfern, Chippendale has recently emerged as a hot spot of Sydney’s creative arts scene with contemporary galleries and small business joining cute cafes and converted warehouse accommodation. 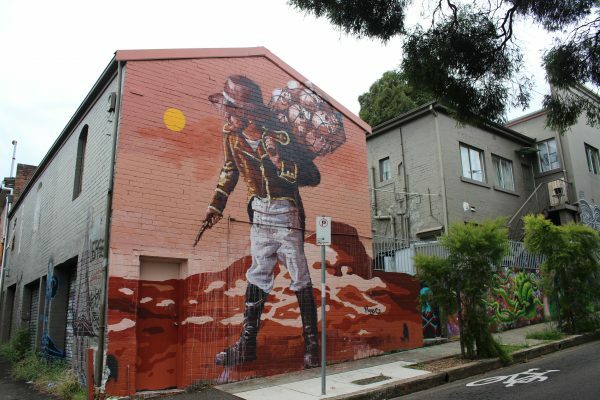 A stroll here will find work by Scott Marsh, Fintan Magee and Phibs. While you are here take a look at the White Rabbit Gallery which showcases the best of contemporary Chinese Art. Some of the exhibitions are pretty out there and great for stimulating conversation. The tea house is a lovely spot to rest your feet and try one of the many Chinese teas or yummy dumplings. How to get there: Short walk from Central or Redfern Stations or take any bus that runs to Broadway and get off at Central Park Shopping Centre. 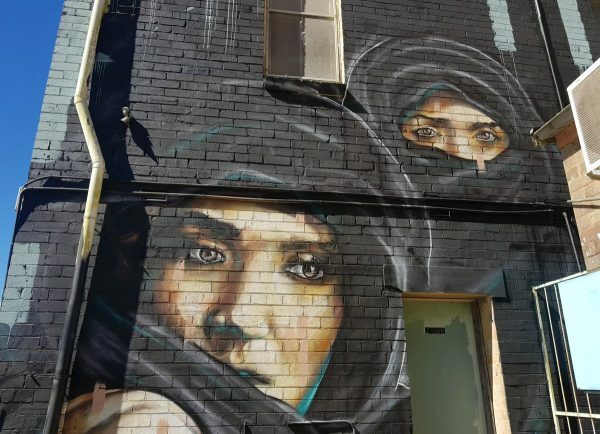 Street art has long been part of the Redfern community. The art here has a strong political focus and also explores the social history of its inhabitants. 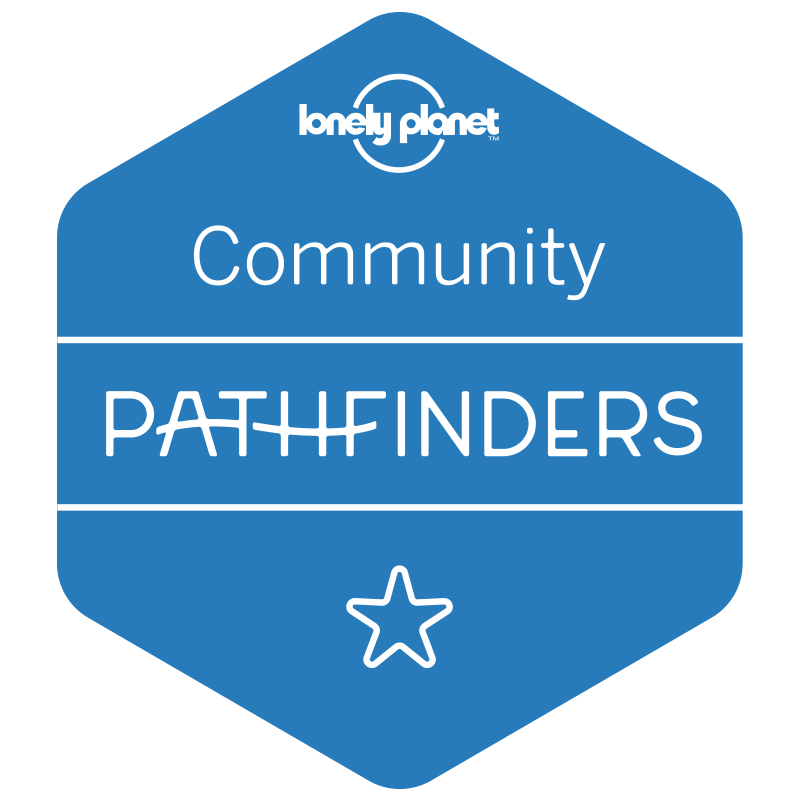 A significant number of indigenous residents call the area home and its a great place to see examples of their work. 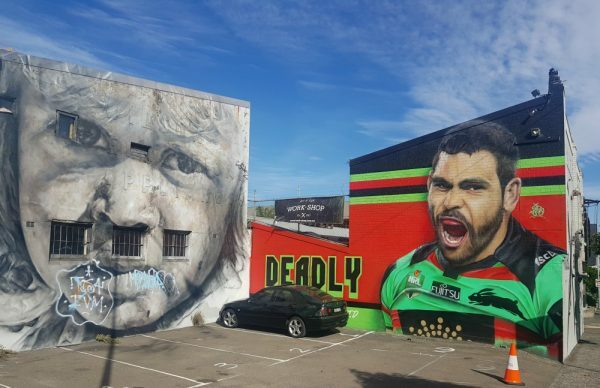 Mural of a young indigenous girl by Guido van Helten and local football favourite Greg Inglis by Sid Tapia on the walls of Work-Shop on Cleveland Street. One of the most iconic artworks here is the mural “40,000 years is a long time” which spans the railway bridge directly outside the station. It appeared in 1983, the work of a number of artists including Tracey Moffatt and Avril Quaill. Its restoration was recently completed thanks to funding by Sydney city council and work by local artists including Thea Perkins. 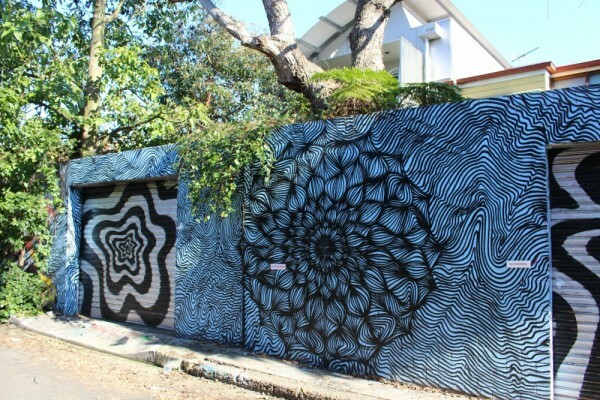 A very new addition to the best street art suburbs in Sydney, Caringbah recently hosted a festival called Walk the Walls. 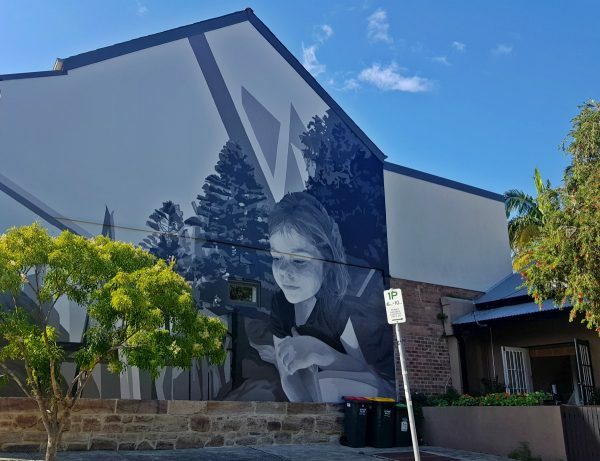 Walk the Walls is a joint project between the NSW Department of Justice and Sutherland Shire Council aimed to reduce unwanted graffiti by filling the walls with commissioned murals. 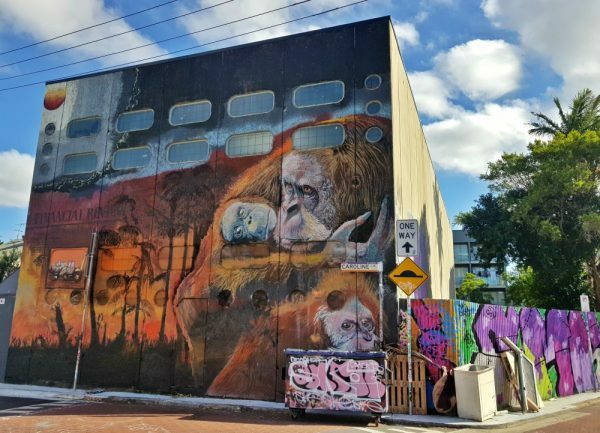 Over 30 murals appeared in one weekend earlier this year with work by lots of Sydney’s best-known street artists including Mulga, Ox King, Scott Marsh and Phibs. So go ahead, download the map and walk the walls. Once you are done jump on the train and head to Cronulla Beach for an off the tourist trail swim. How to get there: Caringbah is on the Illawarra train line about 40 mins south of the city. 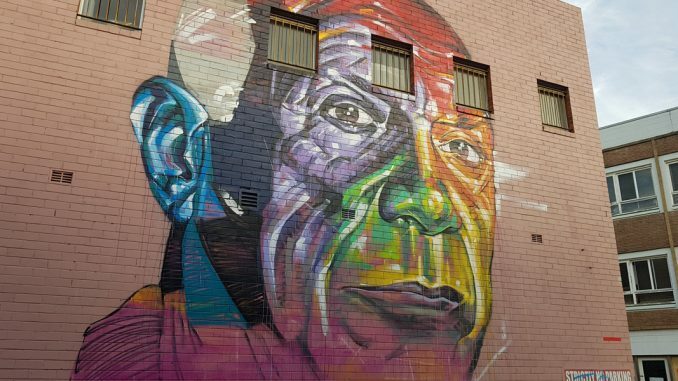 Newtown is the original home of street art subculture in Sydney. 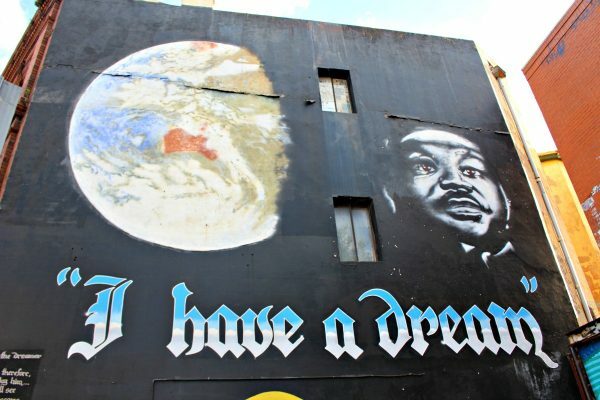 From the creation of the famous “I have a dream” mural in King Street in 1991, this inner Sydney suburb has punch way above its weight when it comes to art per square mile. These days you will find art on the walls on most of the streets running off the main thoroughfare King Street. In between hunting down the art make sure you sample some of the local beers at one of the many pubs along the way. I also recommend stopping by Black Star Pastry on Australia Street for one of their delicious pies and a piece of the iconic watermelon cake. The coffee is also pretty good too! 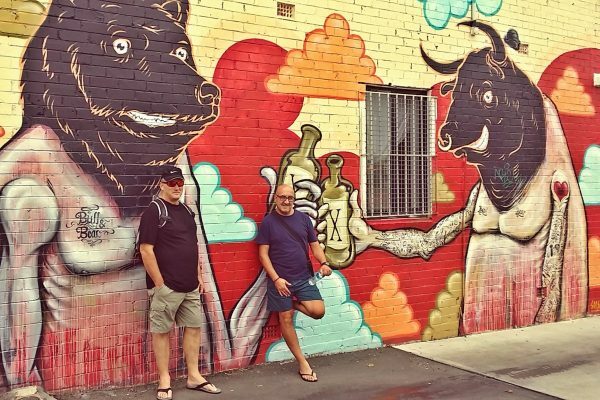 If you fancy making a day of it in Newtown, I have developed a self-guided street art walk with a lot of mural locations marked and plenty of tips for what to eat and drink. Where: King Street and the street running off it from St Peters to Missenden Road. How to get there: Take the train to either St Peters or Newtown Station. There are also lots of buses from the city that run along King Street. Just 7km from the city centre, Marrickville is a lot more industrial than its neighbours of Newtown and Enmore. However, there is some excellent art in the area and a bonus reason to visit it the abundance of craft breweries that have appeared over the last couple of years including Batch Brewing, Willie the Boatman and Sauce Brewing Co.
Where: Wander the streets between the Sydenham Rd, Marrickville Rd and Victoria Rd. How to get there: Train to Sydenham Station and there are also express buses back to the city of the station. Enmore is an excellent spot to explore with an empty belly. 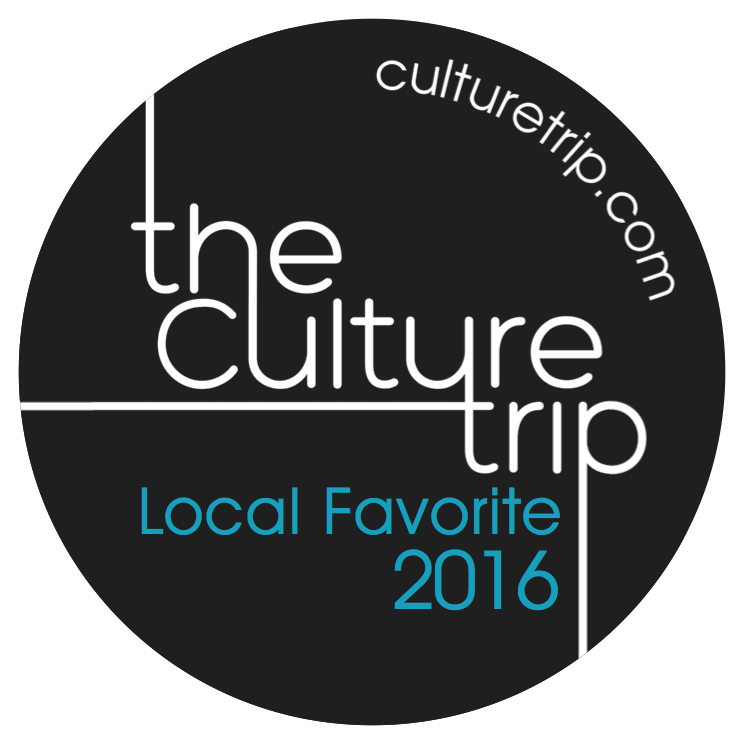 There are so many good eats here that you will be hard-pressed to make a choice, from quick snacks like the mouth-watering sandwiches at Bovine and Swine to the delicious gelato at Cow and Moon or the wine and cheese decadence of Stinking Bishops. There is plenty to keep you happy once you have seen enough art! 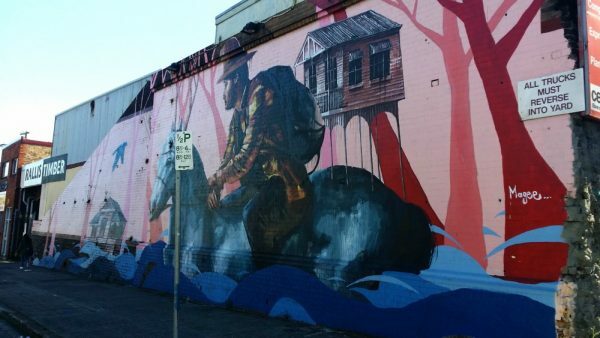 Fintan Magee’s “Settlement” on Newington Street. Where: Gladstone St, Wilford St, Trafalgar Street and the area surrounding them is a good place to start. How to get there: The limited stop M30 bus route from Park Street at Town Hall or walk from Newtown Station. While the main drawcard in Katoomba is, of course, the Three Sisters once you have explored the natural beauty of the area I suggest you head to Katoomba’s main street for lunch and an art walk. 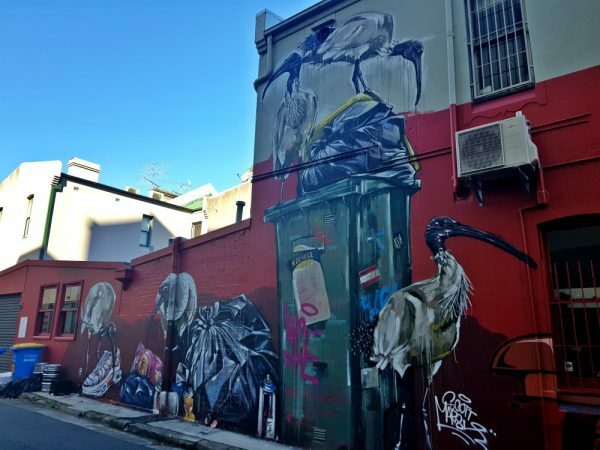 Just behind Katoomba St, off Waratah Place, you will find 30 murals by some of Australia’s top artists hidden in a back lane. 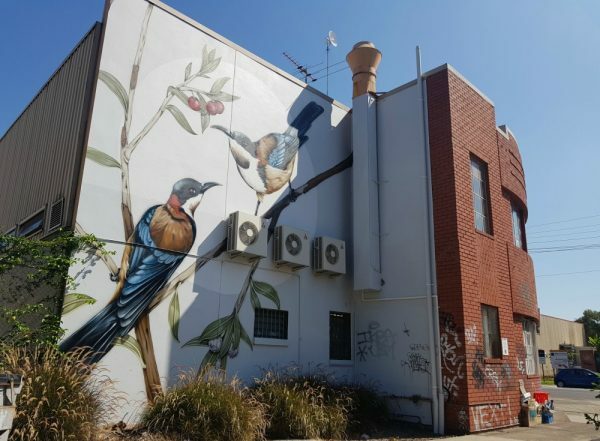 The laneway is the result of work by Street Art Murals Australia (SAMA) who worked with local council and business owners and crowded funded almost 20K to bring the project to life. 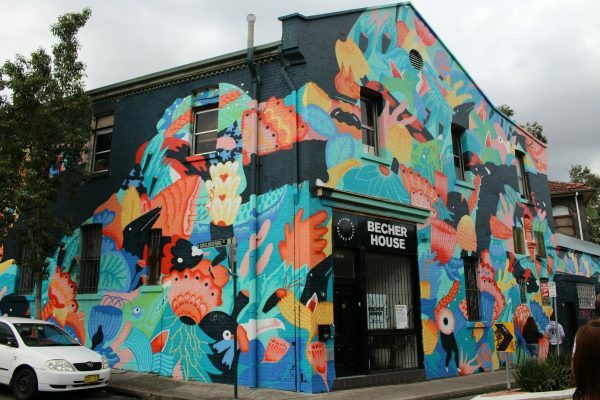 For the last few years, the beachside city of Wollongong has hosted the three day Wonderwall Festival which has resulted in a vast number of fantastic walls that are well worth the 90 min train ride from the city. We spent about 2 hours snapping away when fellow bloggers and Wollongong locals, Paula and Gordon from the Contented Traveller, took some time out to show us around. Check out their coverage of all the Wonderwall murals here. There is plenty to do in the area while you are visiting including some great beaches, two lighthouses and the largest Buddhist temple in the Southern Hemisphere. It’s worth considering staying the night and making a weekend of it! 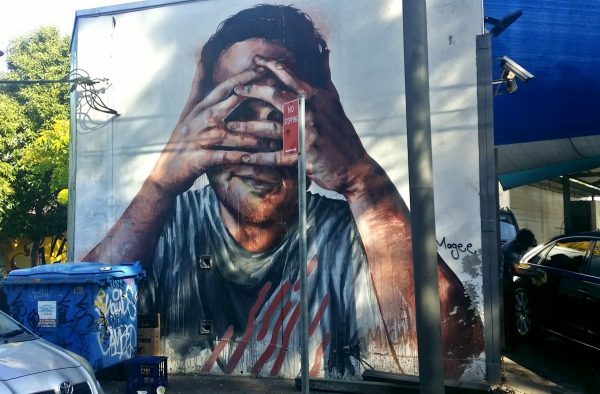 Want to find the newest street art in Sydney? Join our Sydney Expert Facebook Group where you can a local for their favourite walls. 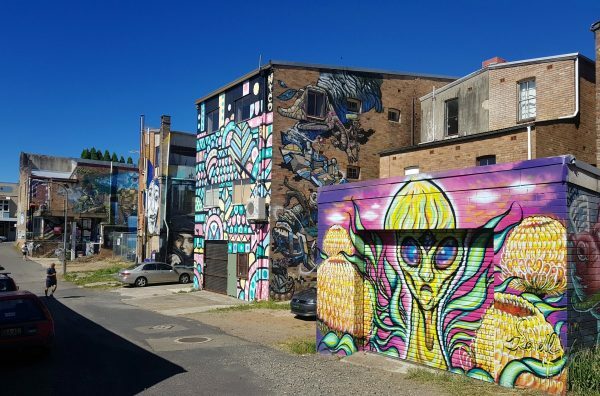 If you prefer the idea of a guided tour there is a great company called Culture Scouts that offer several tours including a fantastic tour of Newtown’s best street art. Great summary Paula. Looking forward to getting to the places I haven’t yet seen. By the way another suburb that has a street art project called wall2wall is Leichhart. I haven’t been to Sydney, and I know when I do I’ll love seeing all the street art. The popsicle one and the Australian bin chickens are my favorites. Thanks for the tips on Icebergs, I’m always up for a place to relax with a drink and view when I travel. Wow, there are so many beautiful and FULL SIZE murals in Sydney. Sydney appears fully committed to the street art scene. Thank you for the comprehensive guide. “40,000 years is a long time” seems like a most epic piece indeed. Yes I keep driving by it but I must get a photo of it this week. Such a thorough post, I love this! I don’t even remember seeing so much street art when I visited Sydney. Street Art is something that is absolutely fascinating. Of late I look out for it wherever I go, even the smallest of towns or villages. It is a window and tells many silent stories of the place, its people, and culture. Sydney’s street art looks to be on an altogether different level. like it has been honed into a fine art. All the murals are so colourful and vibrant but the best one for me is Sharon Billinge’s beautiful mural in Margaret street Newtown.